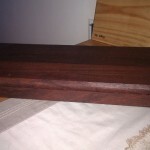 All my life my dad has been into woodwork. My sisters and I were usually woken on a Saturday morning by the sound of power tools and we loved hanging out in the shed with dad and the smell of freshly cut wood. We only had a few pieces of store bought furniture. Dad made our beds, coffee tables, television cabinets and bookshelves. When we moved into our first home that wasn’t a rental dad built the wardrobes, a window seat, bookcases and a back veranda. Over time he replaced the horrible plywood walls and the laminated kitchen boards with pine. Christmas presents were made to order. Dad once helped me make a bookcase for a boyfriend’s 21st birthday but aside from that I was always happy to draw my pictures and place my order with dad. 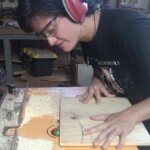 I decided that I wanted to learn how to make my own wooden chopping boards. My current boyfriend had a glass chopping board which I hated and when I found out they can damage knives and chip, causing dangerous contamination of food I was convinced it should be replaced. 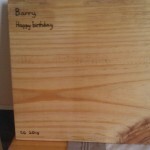 So I set out to make a chopping board for his birthday (see a pattern here?). First step was to change my pattern with dad. I didn’t want him to do all the work but teach me how to do things for myself. To start we had to choose the wood. 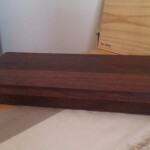 Barry is really into recycling and the environment and stuff and dad had some West Australian Jarrah which he acquired when a friend remodelled their kitchen. Recycling, tick. 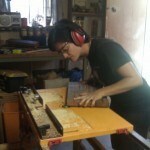 I watched carefully while dad cut the pieces to size. 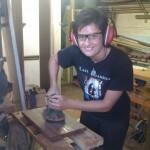 The power saw is a little scary but I reckon I’ll get the hang of it soon. Then we glued the pieces together. I was pretty capable of taking care of that. 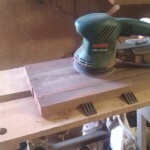 Clamping the boards so the glued pieces would be as tight as possible also wouldn’t result in any loss of digits. 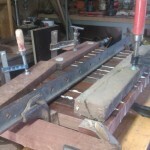 I’m not quite strong enough to turn the clamps as tight as they could be though so dad took care of that. We left them for a day or two then unclamped them and ran them through the thicknesser to even out the surfaces. Until it broke. 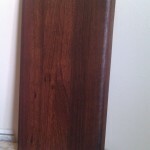 That Jarrah is hard! Routing the edges was next. Dad was quite nervous of my doing this step. The router blade spins at such a high speed and can have a tendency to run away with you and remove a finger. 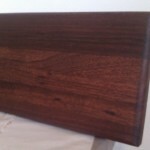 But I took it slow and created a lovely concave edge on my board. At first I was a little too slow and the heat created by the router blade caused the wood to burn. But with more practice I got less nervous and faster, creating a lovely edge. The worst I could do with a power sander was deep exfoliation so dad went to the office and left me to it. I spent hours lovingly sanding my boards with three grades of sand paper. I loved being covered with red dust from the wood (though mum didn’t love it so much when I went inside). The next step was oiling them. We used organoil, a hard burnishing, tung nut based oil suitable for food surfaces like benches and – you guessed it – chopping boards. They turned out beautifully and Barry was thrilled. I think he was extra surprised not get something hand crocheted by Simone or more pyjamas sewn by Simone. I really enjoy the process of building something by hand. I was very proud of myself. I got to spend some time with my dad and I didn’t have to unpick any of my stitching (something that happens a fair bit when I’m making a dress with mum). 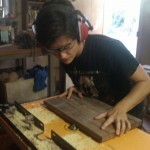 And so, handmadebysimone.com/boards was born…Thanks, dad! If you’re interested in having a custom made chopping board by me and my dad, please contact me at info@handmadebysimone.com. 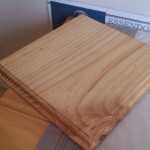 At this stage, custom made chopping boards are only available within Australia. Please let me know if you are further afield and we can discuss options.